The American Dental Association recommends that most people receive biannual dental checkups and cleanings. Unfortunately, these checkups can be easy to delay or even skip, particularly for those who experience dental anxiety. Regular dental checkups allows for early detection of oral health disease which can easily be treated to help restore your dental health. Our United Dental Care HMO dental insurance dentist in West Hollywood offers comprehensive dental services which provide you with access to quality health care all under one roof. Teeth with minor decay or damage can be restored with tooth-colored dental fillings. Porcelain crowns can be used to restore teeth that have undergone root canal treatment, to support dental bridges or to strengthen teeth that have suffered severe decay or damage. Dental implants are the healthiest, most natural tooth replacement options available today and can be used to support porcelain crowns, dental bridges or even dentures for a comfortable, secure, long-lasting restoration. Periodontal treatments can help eliminate infection and restore the health of your gums. Invisalign or traditional braces may be recommended to correct bite abnormalities or misalignments. Our West Hollywood cosmetic dentist can restore the natural beauty of your smile or improve the appearance of stained, misshapen, worn or damaged teeth using teeth whitening treatments, porcelain veneers, Lumineers or other cosmetic treatments. Oral and inhaled sedation treatments can help you feel calmer and more relaxed throughout any necessary treatments or procedures. 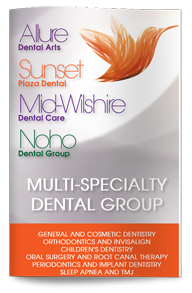 Contact our dental office today to learn more about your treatment options or to schedule a consultation with our United Dental Care HMO dental insurance provider in West Hollywood.